They do not get sick or slack off (unless something needs fixing), their job performance is always consistent, and they can almost always work faster than humans. 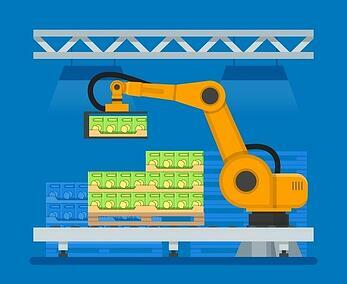 That is why robotics are at the leading edge of the automation revolution that is increasing productivity across all sectors of American manufacturing. As with many technological innovations, discrete assembly (specifically, the auto industry) was the industrial sector that led the way with robots. As it often does, the food sector is bringing up the rear. However, it is catching up with a vengeance. The Robotic Industries Association says that the food and consumer products sector increased orders for robots by 32 percent in 2016. According to one estimate, robots are used in 94 percent of food plant packaging operations and one-third of processing operations. The big appeal of robotics in packaging is flexibility. With just the touch of a button, line operators can change the configuration of a case or pallet load. This confers the flexibility needed to satisfy trade customers who demand ever more customized loads, while not sacrificing speed. Robotics took hold at the end of the line with packaging, and is progressing back up the line, through processing. This is, as noted, mostly because packaging is easiest to automate. It is logical in another way as well. If you increase a line’s capacity, the best way to do it is backward from the end, so that no part of the line will be overwhelmed. To look at it another way, when packaging increases its capacity, it allows processing to speed up. When processing increases capacity, it allows a speedup at the very head of the line where ingredients are added. Flexible bag-in-box and intermediate bulk containers are often used to deliver basic ingredients like syrup, oil and flavorings. They can be especially useful in lines whose capacities have been augmented by robotics. Their greater efficiency and speed in evacuation, compared with rigid bulk containers, makes them better able to keep up with increased demand. Additionally, with an empty bag and collapsible frame post-evacuation, handling becomes easier, making flexible packaging more suitable for a labor force reduced by automation. Are you taking advantage of robotics and flexible packaging solutions in your processing plants? To find out more about what is available to you, contact us for a free sample and download our corporate brochure today!